When one thinks of the Aberdare forest in central Kenya, images of lush green woodland, big elephants and a series of inter connected rivers come to mind. Kijani visited the Aberdare National Park for a tree planting event that was organized by the Sirikwa Wildlife Trust. 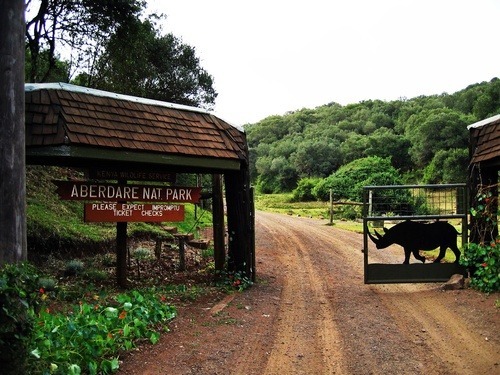 Entrance to the Aberdare National Park. We interacted with youth from the Sirikwa Wildlife Trust – an organization also founded by college graduates – on the foggy four and a half hour long journey to the park, making a brief stop in Nyeri, famously known as the town where Lord Baden Powell – founder of the Boy scouts movement – spent the last years of his life. On arrival at the tree-planting site I was heart-broken, to say the least! To think that a forest of such critical ecological importance (the Aberdares forest functions as a water catchment area for major rivers in Kenya) was so dilapidated was a heart wrenching truth. One of the park scientists said that Illegal logging and overgrazing of cattle by the community were the main causes. However, this did not dampen the spirits of the 124 people gathered together. Faces gleaming with laughter gave a sense of satisfaction and realization that with every tree that we planted, not only were we giving back to the earth what was taken from her, but we were reinvigorating our nation’s pride and history. By the end of the exercise we are proud to report that on this particular day, around 283 trees had been planted, new friendships were forged and everyone made it back safely to the city of Nairobi. I was reminded that the journey of 1000 miles starts with one step. We can all take that step – but it’s more fun when we do it together!